Posted by bessie on Wednesday, April 08, 2009. Congratulations to Brighter Planet members – you shut down a dirty, coal-fired power plant for a week! And you did it not by waving signs and shouting “No!,” but by saying “Yes!” to finding better answers to the problem of how to meet our energy, economic, and environmental needs. Your actions as Brighter Planet members as of December 31, 2008, allowed us to transfer 67,342 tons of carbon offsets to Clean Air - Cool Planet for retirement – roughly the equivalent of a week’s emissions from that outdated, dirty power plant. If you’re reading this and are not yet a part of our program, let me explain: Our members earn high-quality offsets with the Brighter Planet Visa credit and debit cards, and they can also buy Planet Shares to counteract their carbon emissions. How do they know they’re making a real, permanent difference? Our policies and practices of additionality at the front-end, retirement at the back end, and transparency throughout …that’s how. We only invest in projects that meet our rigorous carbon offset policy and survive the expert scrutiny of our Project Selection Committee. None of our projects would have been built were it not for the prospect of incentives from the sale of offsets. Offsets are legal property rights. 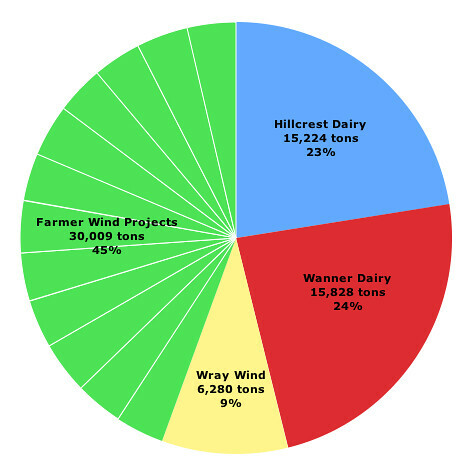 The rights to the 67,342 tons we transferred to Clean Air - Cool Planet come from the fifteen offset projects shown in the pie chart below. Clean Air - Cool Planet is a science-based, non-partisan non-profit dedicated solely to finding and promoting solutions to global warming. They will hold these offsets in perpetuity to ensure they can never be sold or used again. That’s how our and our members’ objective of fighting climate change by reducing net emissions is achieved.